Skin Type :Hypoallergenic. Formulated for sensitive skin. Result :Intensely hydrated, skin feels soothed. It feels supple, refreshed and velvety-soft, helping the skin feel free from discomfort. The skin feels replenished with water, as if continuously hydrated with misting micro-sprays. I was looking after a good hydrating serum, which won't break me out or make my skin even worse. After I had some bad experiences with drugstore creams... 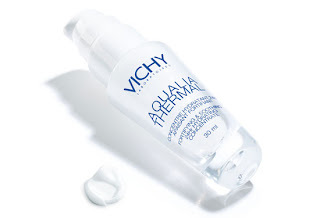 I took a chance with Vichy. Light, watery consistency with a hint of smell (fresh, like most serums). The color is quite transparent, yet blurry. It sinks in really fast and you don't really feel any heavieness afterwards. Skin is more softer and there's a slight feeling of relief + there's no clogged pores. Glass bottle with a pump. It's not too big and it's quite handy. It's meant for sensitive skin and it's hypoallergenic. I do have a dry-combination skin and it doesn't break me out. I guess it can be used on oily skin since my sister tried it out (she has oily-combination skin) and she didn't break out either. It's meant to improve your skin care ( using it with your daily cream or before it) or night skin care. I personally like to use after I go too sleep to really absorb. It's also great to use it before your foundation, especially if you notice any dry patches. I think this serum is worth it's money (about 18€ in Europe) and I did noticed some great results with it. My skin looks much better, glowy and it's not dull like before. I can notice a slight glow on my cheeks and nose bridge, which I didn't have before. Skin looks much healthier, but not oily. It's even more softer ( thanks to the thermal minerals in it). I highly recommend it, if you wanna try something new and add a bit more care to your face. I guess every person should have a good hydrating serum. great review, I much prefer serums over creams, I find creams too heavy and leave my skin greasy before applying foundation. This one sounds good. you still use it now? how was it? No, not anymore.I'm trying out different skincare. However I do miss it in my skincare routine in the winter.